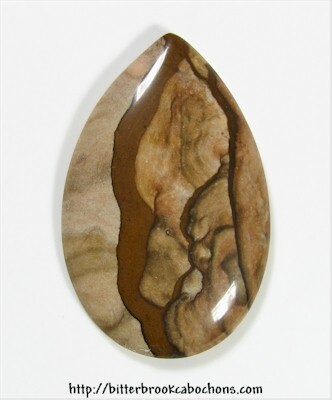 Here's another Biggs Canyon Jasper cabochon from the same slab as BIG014. There's a 2.5mm hole in the back of this cab that isn't very deep; it doesn't continue anywhere near the front, but I wanted to mention it. A very pretty cab! Gloria at Wire Treasures wire wrapped this cab into a pendant; you can see it here! 41mm x 27mm x 5mm; cab has a flat girdle. Weight: 40.60 carats.